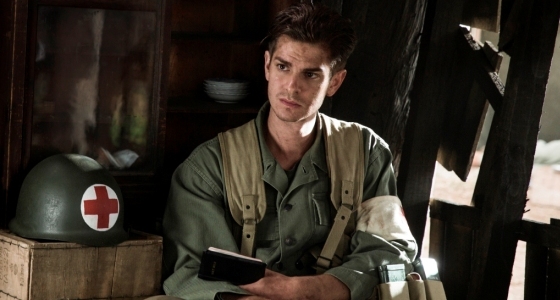 Mel Gibson's Hacksaw Ridge tells the true story of Private First Class Desmond Doss (Andrew Garfield) a WWII American Army medic who served during the Battle of Okinawa in 1945. The twist in this war film is that Doss, as a faithful Seventh Day Adventist, was a conscientious objector or, as he liked to say, a "conscientious co-operator." Telling the story in two parts Gibson details events in Doss’ life leading up to the battle and then his involvement in the battle itself for which he was awarded a Medal of Honour citation. Based on his religious convictions Doss’ refusal to use or even hold a gun caused him considerable trouble during basic training and made it difficult for fellow soldiers to trust him with their lives. Superior officers didn’t help. Comments made by men like Drill Sergeant Howell (Vince Vaughn) — "Private doss does not believe in violence ... do not look to him to save you on the battle field" — only exacerbated the situation. The irony is that Doss, whose only desire was to serve as field medic, was in fact there to do just that — save fellow soldiers on the battlefield. Doss' childhood family life was devout but less than desirable with an alcoholic and abusive father, Tom Doss (Hugo Weaving). The family home featured a framed copy of the Lord's Prayer and the Ten Commandments which included an illustration of Cain murdering his brother Abel. This unique piece of art had a lasting impact on Doss as did seeing his drunken father threaten to shoot a family member in their home. These childhood memories solidified his desire to save rather take life. While Doss’ religious convictions, including his refusal to work on Saturdays, act as the film’s heart and soul Gibson is careful to point out that not all Christians share these same convictions. Sadly, to create dramatic tension, Christians who didn't share Doss' pacifism are almost monolithically depicted as insensitive brutes and bullies. While this is accurate, the trouble is that for dramatic reasons Gibson sets up a false dichotomy as a sort of straw-man argument during most of the film when, in the end, it's the co-operation of Doss' religious convictions with those of the combat soldiers that wins the day. This becomes clear in the film’s last act when the soldiers who had previously been set against Doss finally respect him and admire his valour. 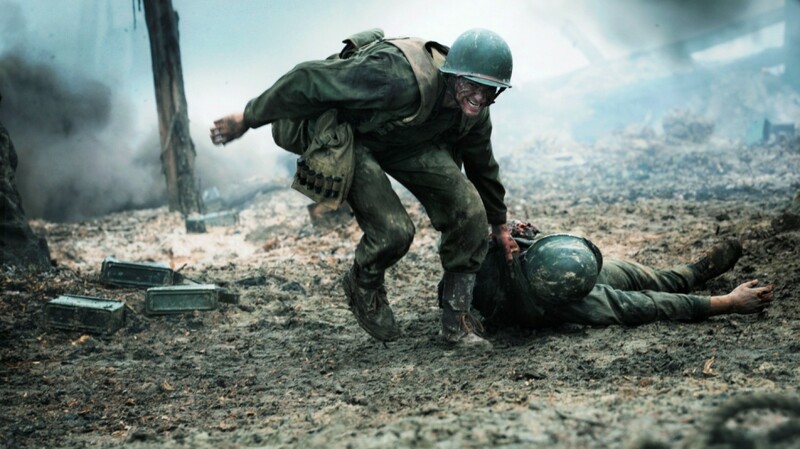 The vocation of “soldier” is ultimately emphasised as being godly in a short scene where Captain Jack Glover (Sam Worthington) holds off the final push to take Okinawa's Maeda Escarpment (dubbed Hacksaw Ridge) on the morning of Saturday May 5, 1945. Glover delays the final push until Doss finishes praying. After the prayer, Captain Glover says to the infantrymen, "Let's go to work." Within the ensuing battle multiple scenes show respect and cooperation between Doss and the rest of the soldiers. Christian viewers will want to remember that the vocation of soldier is not one that embraces murder. The Fifth Commandment, "You shall not murder" (Exodus 20:13), isn't a blanket prohibition against all killing. Thus, the vocation of soldier can involve killing that is not murder. Soldiers operate under the governing authorities and as such they are God's servants carrying out God's wrath on the wrongdoer (Romans 13:4). It’s good to note that when soldiers came to John the Baptizer asking what they should do to avoid the judgment of God, he doesn't say, “Give up your work as soldier” but rather “Do not extort money from anyone by threats or by false accusation, and be content with your wages” (Luke 3:14). Like all God-pleasing vocations soldiers are expected to execute their work virtuously on and off the battlefield. Gibson, who directed films like Braveheart (1995) and Apocalypto (2006), is no stranger to war films. While the first half of the film includes Doss' romance with a young nurse named Dorothy (Teresa Palmer), the latter half is set on the battlefield where Gibson pulls no punches especially in the film’s first battle scene which is particularity jarring and gory. This makes Hacksaw Ridge as sour as it is sweet. Doss' optimism and faith are sent through the meat grinder of combat and they come out strengthened not crushed. Gibson sets the stage for this crucible of faith by beginning the film with a voice-over of Doss on the battlefield reciting Isaiah 40:30-31, "Even youths shall faint and be weary, and young men shall fall exhausted; but they who wait for the LORD shall renew their strength; they shall mount up with wings like eagles; they shall run and not be weary; they shall walk and not faint." Doss is shown as a man who reads Scripture, keeping a small Bible on his person even on the battlefield. He is also depicted as a man who prays. His prayer life is rich and to the point. When finding himself alone on the escarpment after the rest of the American army had retreated Doss continues rescuing wounded men from the battlefield lowering them down one by one, praying, “Lord, help me get one more.” By the end of the night he'd saved 75 men — daring work that gains him the respect of his fellow soldiers. With Hacksaw Ridge Gibson seems to be redeeming himself within the Hollywood system which bodes well for future projects like his rumoured sequel to The Passion of the Christ (2004). Garfield's strong performance as Private Doss is also a welcome surprise as he stars in the upcoming Martin Scorsese film Silence(2016) where he plays a Jesuit priest working as a missionary in 17th century feudal Japan amidst persecution. Hacksaw Ridge is not for everyone. The gory battle scenes justify the film’s R rating. However, this film takes Christian faith seriously and encourages viewers toward virtuous and ethical living within their vocations. By valuing conviction, the film could challenge reflective viewers to think about whether their personal convictions in life are defensible. Christian viewers will want to think on whether their personal convictions in life are defensible based on the whole counsel of the Word of God. When it comes to Christian faith in the midst of war Hacksaw Ridge easily takes its place alongside recent films like Fury(2014) and Unbroken (2014).